A Chinese emperor could not sleep annoyed by the sound from the waterfall painting in his bedroom. The Greek painter Parrhasios tricked Zeuxis by drawing a curtain on his painting. The history of image is full of such anecdotes that tell us how visual images can often delude or mislead people: that mere imitation, illusion and fakeness can actually deceive and disturb actual human beings who breathe through flesh and blood, and are supposed to make rational judgment. We could name it ‘Simulacrum Obscura,’ in the sense that it hides its own imitative or imaginative nature to cloud rationality and reality. Although strictly speaking art cannot be equaled to image (coming from the Latin word ‘imago’ or ’simulacrum’), it is true that the imitative and illusionary nature of image has been appreciated as an important characteristic of art which mainly derives its source from images. In this context, we might say that art before modernism had always been an ‘imitation,’ ‘illusion,’ or ‘representation’ of the already existing reality. It was with the invention of photography that art could overcome its ‘Simulacrum Obscura’ characteristic, changing its focus from representation to abstraction. Banishing everything except the materiality of the medium, Modernism art has strongly negated the ‘Simulacrum Obscura’ nature of image and strived to become reality in itself. However, here we encounter a form of art that can neither be categorized as ‘Simulacrum Obscura’, nor modernism art. Instead of hiding its fake or imitative factors, this form of art interweaves them with fragments of reality to reveal the hidden side; the clich?s and vulgarities of our real world. This form of art could be named ‘Simulacrum Lucida,’ meaning a bright, positive illusion that enlightens and illuminates the real world. A little boy is standing on a snowy path that reminds us of a scene in a fairy-tale-like soap opera. 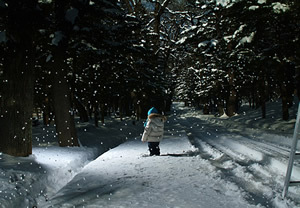 Wearing a blue cap and muffler and wrapped in a cozy looking overcoat, the boy is turning his back on us gazing towards the forest in front. This picturesque scene is a photographic image and the sight is so charming that at first glance, it is hard to tell if it carries any particular content or meaning. As we pay more attention, however, the photographic scene seems somewhat too picturesque and awkwardly unnatural that we find ourselves curiously scrutinizing the details looking for some clue. Here it is! The falling snowdrops are indeed styrofoam balls hanging in midair and a leg of a tall ladder can be seen in the right corner of the picture. 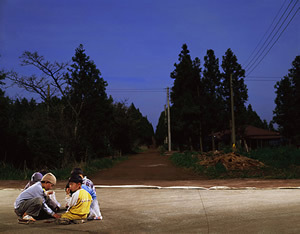 In addition, while the atmosphere in the photograph suggests that it is nighttime, we can see that a mysteriously long shadow is falling at the little boy’s feet. The fact is that the picture was actually taken during daytime, but someone, probably hiding somewhere in the forest, is shining a strong light towards the boy and therefore plunging everything else into darkness. The moment we realize this, the photograph no longer looks like a mere snapshot of our everyday life or a record of a single memory or landscape. It rather seems like a picture taken with a particular intention, or perhaps staged in a setting. Still, the exact perspective of the dense forest and the thick blanket of snow on the ground and trees are strongly suggesting that the picture can still be linked to something real, something that actually happened. After all, we are unable to decide if this is a real or a simulated picture. Our ability to tell true from false is endangered before a single photographic image. Hence the time to clarify the real (or simulated) facts about the picture and the moment the picture was actually taken. The producer/creator of this picture is Yeondoo Jung, and the unsettling picture in question is one of his new work series named Locations. If you are familiar with Yeondoo Jung’s previous oeuvre, you might presume that these new works are simulated photographs as well. One of his previous projects called Bewitched, for instance, is based on interviews with ordinary people, realizing their unfulfilled or most desired dreams in the form of photography. Another project titled Wonderland is similar in concept but the dream holders here are much younger, mainly little children from kindergarten. It is about capturing their ‘wonderful dreams’ through their own drawings and realizing these dreams by transferring it into photographic images. 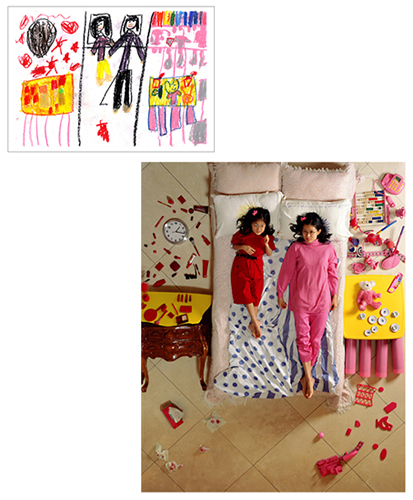 The main concept that these two works have in common is ‘dream (hope/fantasy)’. And this is why some might assume that the new Location works are also a ’simulation’ of dreams. It is actually true that elements of fantasy can be found in the Location works too. The landscape that is featured in the pictures looks a lot more dramatic and dreamy than what we encounter in real life. Nevertheless, the artistic intention is not as plainly apparent as in the older works. The Location pictures look more like clich?d dream images that we may have seen in an advertisement or a movie, rather than a photographic realization of someone’s unique dream. Neither do they look like the visual reproduction of children’s wild imagination. The fact is that they rather look like an imitation of the material desire of our pop culture. And that is why at first sight it is hard to tell if there is any special intention. And here comes the big question. What’s the artistic intention of the Location series? (This question is inevitable when we consider that the artist’s intention or idea has always played a key role in his works.) The Location series does not seem to carry a simple and clear message like its precedents. However it is this ‘unclearness’ that does the trick here. Ironically enough, the ‘unclearness’ is actually indicating that everything is ‘clearly shown’ on the surface of the image. On this account, Jung’s Location project could be seen as a ‘Simulacrum Lucida’. Living in a world where any images can be altered or synthesized, it is almost impossible for us to have an absolute certainty about any kind of photographic images we encounter. Jung’s “Locations” however, shows us the ‘real’ situation and successfully tricks us into misconceiving the ‘real’ landscape’ as ‘fake’ landscape, searching in vain for the boundary between hidden meaning (that doesn’t exist) and concealed reality/simulation (which in fact is not concealed). 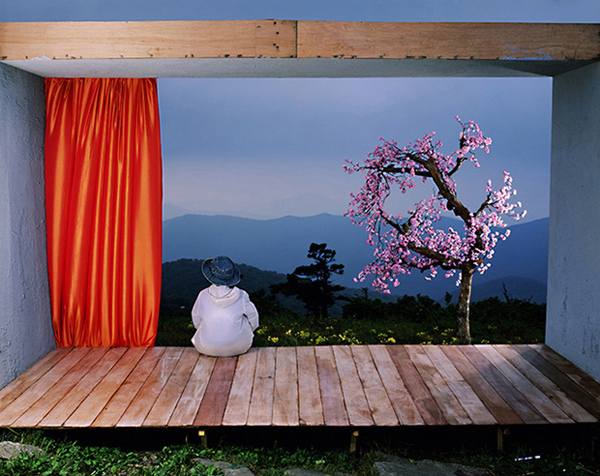 In short, Jung’s work is real photography, but it deludes the spectator to see it as a simulation. The work with the little boy that I mentioned in the beginning is less so, but the other works of the series more strongly incite this kind of confusion. For example, in a picture where the winding outline of a far mountain is seen in the background, an old woman is sitting on a rectangular shaped stage set that looks like a frame of an artwork. A fake cherry blossom tree is standing nearby in the front. Is it the stage set or the mountain that is real? Try another work. At first glance, the picture looks like an ordinary scene of children playing in an ordinary small country town. A closer look, however, reveals that the foreground where the children are playing and the village that shows in the background is crossed by a white borderline which looks like the hem of a projection screen. Is it the foreground with the children playing that is the fake stage or is it the village in the background that is actually a screen projection of a landscape image? How about the picture with the mountain climber? Who is the actor here? 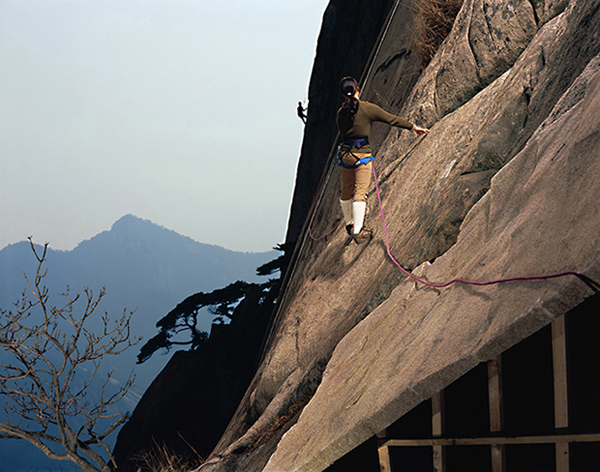 Is it the dark silhouette climbing on the steep mountain wall in the background or the woman hanging on the fake wall that is apparently made of balk? The truth is that everything here is real. In all these pictures, the real and the fake are seamlessly combined in actual space. The rectangular stage set and the fake cherry blossom tree in the first picture were installed on a real mountain and the foreground where the children are playing in the second picture is in fact a fake ground that was set in a country that exists in reality. The fake mountain wall in the foreground of the last picture was temporarily constructed on a real mountain corner. All these facts are not what I inferred but they are more or less obviously shown in the pictures themselves. Again, Yeondoo Jung’s pictures are real pictures that were actually taken in one camera shot. So how should we spectators look at these real pictures, the “Simulacrum Lucida”? Ⅰ. Do not try to distinguish between the real and fake landscape in these pictures. Ⅱ. If you must, do it just for fun as if you are breaking a puzzle. The cost of this will be the fun of appreciating the real thing. Ⅲ. See the details and appreciate the fact that the space we live in is an assemblage full of clich?s and many different objects. Ⅳ. Reflect on how much ‘awkwardness’ can be found in the things that we took for granted; the movie scenes are that once we dreamed about, the landscape of far places that made our heart flutter, the romantic lyrics of the pop songs that we used to sing along. Ⅴ. Amuse yourself with all the fakes, imitations, performances that are audaciously set before the real landscape. The real reality is here for you. Ⅵ. Pay a tribute to the artist who created, assembled and directed all these fakes, imitations and performances. Thanks to him we were able to take a glimpse on the fragments of the shell that holds our slightly upside down world. Ⅶ. Be aware. Think how confident the artist must be to hide the real as fakes and visualize fakeness so audaciously. After the delightful exploration of Yeondoo Jung’s ‘real pictures’, some questions could be raised. With the invention of digital photography and Photoshop, the genuineness of photography as the documentation of reality (subsistence) is often not reliable any more. Jung’s “Location” is based on the present and past stratum of photography. It is about taking even real pictures under the suspicion of ‘fakeness’, a twist on the situation where simulated images are threatening reality. The twist is made like a frontal attack. Real reality and fake reality coexist in real time and space, taken in a single picture. No alteration or retouch is made afterwards. However, the questions start from here. Why all the efforts to make real landscape look like fake, and why compelling the puzzle game to the spectator by inserting the fake in the foreground? Why all the laborious work of installing a fake mountain wall on a steep mountain pass, and adding a crude fake tree or Styrofoam snowdrops to the real landscape that is beautiful in it’s own? Of course we discussed the reasons in the previous chapters. But that was thinking from the artist’s standpoint of view. To repeat it once more, it was to show that the boundary between the ‘real’ and ‘simulated’ is blurry, and that we desire to live in a world where even real reality looks like fabricated fake. About all this, the artist made his statement through photographic images where the tricks are brightly visible. However, isn’t our real world already full of movie like events, soap opera like situation without the artist taking the trouble to use fake stage sets or simulated objects? Considering this, if the artist wanted to show in his work the situation where the real is confused with the fake, or reflect on the fake nature of reality, shouldn’t he have considered digging into the details of the real world without any additional devices? In this previous works Bewitched, the realization of the figures’ dreams is made just temporary and imperfect, only though the photographic image. The dreams come true, but just ‘almost.’ (The catalogue of these works is titled ). Therefore, we can think that the dreams/hopes of these figures are still just ‘daydreams,’ and that it is just the artwork that made these dreams come true. In this context, we can think that in Locations, only the conceptual idea that “our real life is full of truth and lies and it’s hard to tell one from the other” is shining brightly, without touching base with the genuineness and fakeness of our real life. While the simulacrum named “Location” is shining brightly, our reality still remains dark. Therefore, it could be said that the genuine ‘Simulacrum Lucida’ as a real illumination and enlightenment is not fulfilled yet in even in this new works.